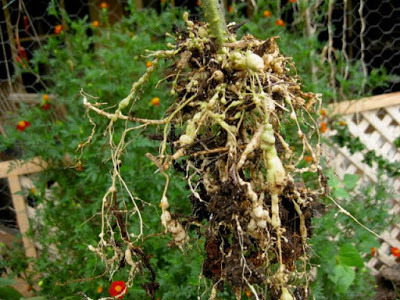 WHAT ARE ROOT KNOT NEMATODES? They are tiny parasites, invisible to the naked eye, that burrow into the roots of plants leaving cancerous like growths that compromise the health and vigour of a wide range of ornamentals and food crops. FACT: Not all NEMATODES are bad – they perform a multitude of beneficial functions that contribute towards the health of the soil – what we are dealing with here are PARASITIC NEMATODES that can cause a tremendous amount of damage to food crops. Troubleshooting an unproductive bed (I’ll leave the jokes to the wits out there!). THE GARDEN DETECTIVE. I had one bed that was just not doing well – things would start to grow and then most would die or linger on looking unhappy. 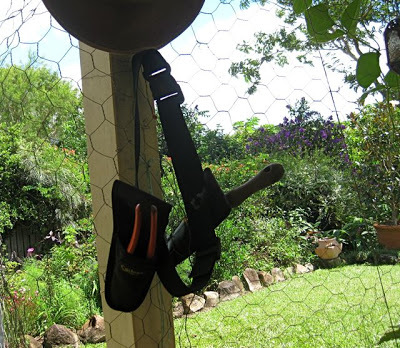 How every gardener can do their own problem solving. The Companion Planting Theory – Sorting Fact from Fiction: In this bed I had planted MARIGOLDS amongst the vegetables to keep the nematodes at bay – this is the perceived companion planting wisdom. This was mixed up with tomatoes, broccoli, eggplant, climbing beans and wild rocket. 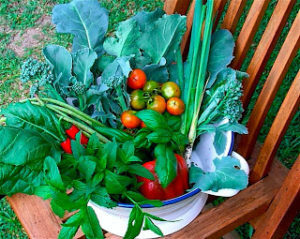 What I Discovered: All the tomato plants were failing to thrive, along with the beans and eggplant – while the broccoli, rocket and marigolds were unaffected. 1. When I pulled up the sick tomatoes I saw that they all had these cancerous growths on the roots – the same with the eggplant and beans, but not any of the other plants. 2. The MARIGOLD roots were unaffected but this showed THAT THEY WERE NOT PROTECTING THE PLANTS AROUND THEM. 3. What about the BROCCOLI and ROCKET, you might say? Doing a bit of reading around the subject I discovered that because these plants are both in the BRASSICA family, and they exude sulphur from their roots (the smell of boiled cabbage!! ), which is probably what the strong smelling MARIGOLD is doing too (a bit like men wearing Brut?) – deterring the nematodes from getting too close to them. 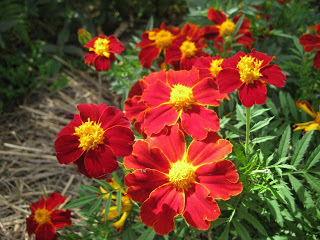 MARIGOLDS DO NOT PROTECT THE PLANTS AROUND THEM FROM NEMATODE ATTACK – JUST THEMSELVES. HOW CAN WE USE THIS KNOWLEDGE TO OUR ADVANTAGE? 1. NEMATODES will persist in the soil and keep causing damage if they have favourable host plants so having an understanding of plant families is going to be your best ally. 2. EXCLUDE the plants that are nematode magnets and INCLUDE the ones that put them off. Tomatoes and eggplant are in the same family (SOLANACEAE) so they are going – along with their brothers and sisters – potatoes, capsicum, chillies. 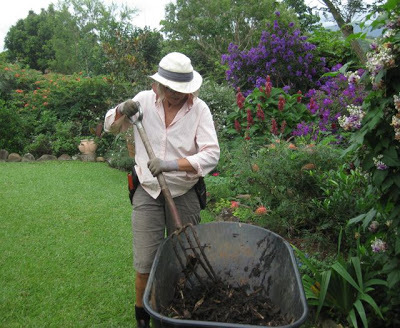 Make sure you destroy the affected plants and don’t put them in the compost.
. Put in a garbage bin full of water, with the lid on to eliminate mosquitoes breeding, and leave until they rot down then pour this slurry on the garden.
. Place in a securely tied black plastic bag in the sun until decomposed – then put on the compost. HOW TO GET THIS UNHEALTHY BED BACK INTO SHAPE? Having a bed so badly affected by nematodes tells me that there is something out of kilter here. When plants become diseased it usually means that they are under stress and, as usual, THE ANSWER PROBABLY LIES IN THE SOIL. FACT: The heavy rainfall that we experience over the summer months invariably leave the soils ‘tired’ and depleted of nutrients. For the full story take a look at the page UNDERSTANDING SOILS. You will find that they are often quite ACID and lacking in ORGANIC MATTER. What to do? STEP 1. Do a pH test to determine the first step to take. 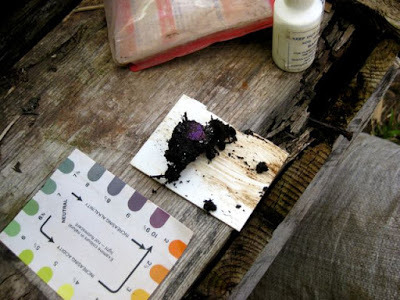 When I did a pH test in the ‘not happy’ bed I saw that, in fact, it was quite alkaline – about 10 when it should be between 6-7 (NEUTRAL – this the optimum level of acidity/alkalinity in the soil when microorganisms thrive and nutrients are released for root uptake). I then realised that I had been topping it up with mushroom compost and have since discovered that a large component of mushroom compost is CHALK (calcium carbonate – very alkaline). STEP 2. I now realised it was time to empty out the compost bins, to correct this imbalance, and put it to good use. I mixed up the COMPOST with some BLOOD and BONE, dried GRASS CLIPPINGS to give the soil an addition of ORGANIC MATTER and correct the pH – make it neutral – 6.5-7 is what we are aiming for. For acid soils (5 and under) you need to be adding all of the above plus some DOLOMITE or AGRICULTURAL LIME to raise the pH. STEP 3. After pulling out all the affected plants we are now going to use the MARIGOLDS and their nematode deterring properties to fumigate the soil. I simply pulled all the ones out that I had around the garden, chopped them up and left them to rot down on top of the soil – bingo – no more nematodes. 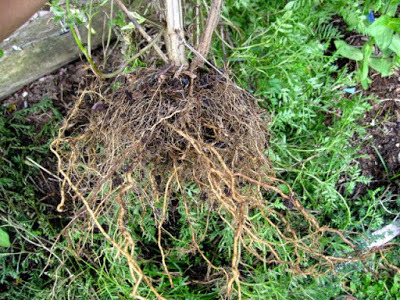 TOP TIP: For an empty bed where you are starting from scratch and want to ensure that it is nematode free and is ultimately going to give you the healthiest FOOD – PLANT A GREEN MANURE CROP of a mixture of MARIGOLD, MUSTARD (a brassica) and LEGUME (fixes nitrogen on their roots) seed (e.g. vetch, cow pea, lupins), and a GRASS (e.g. barley or ryegrass – adds much needed organs matter and carbon to hungry soils). When they are about 50 cm high, slash them down to the ground, cover with a thick layer of straw to deter further growth, wait for that to break down then plant away. This is a centuries old practice for improving the health of the soil organically and without the need for chemical fertilisers. 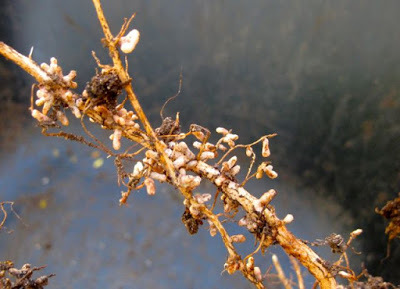 Nitrogen nodules on broad bean roots. Don’t confuse this most desirable phenomena with the cancerous looking roots of a nematode affected plant. STEP 4. Put the kettle on! Reference sources: Hawaii University School of Agricultural Science. Gardening Australia. Queensland Department of Primary Industry. “To be a successful farmer one must first know the nature of the soil.” – Xenophon, Oeconomicus, 400 B.C. Greetings. Send me a message and I will reply. Why on earth would you kill nematodes? They didn't cause your root rot and in fact help prevent it. They also help control 200 types of pests in your garden. I purposely put them in my garden and also my lawn to help with fleas since I have a dog. Research before you spread such nonsense. This was a fascinating exercise and something I love about Nature and gardening – you learn something every day! Thanks for these valuable tips! More power!